Banff lodging deals and ski vacation packages. Three Ravens Restaurant & Wine Bar: A little something for everyone...plus great wine! The Waldhaus Pub & Restaurant: Amazing views and even better cheese fondue! Bear Street Tavern: Great place for pizza. Must try their house made honey & chili oil! The Bison: The one place for all things bison (with a few other items on the menu as well). Banff Ave Brewing: Local brewery with fun beer flights and tasty pub fare. Welcome to Banff, one of the most beautiful and protected places on Earth. With its small town charm, Banff offers visitors the chance to experience the Canadian Rocky Mountains, sparkling glacier-fed lakes, and a plethora of wildlife. Banff is proud of its history and heritage in the Town of Banff. Take a little time to learn about the founders of this community, and walk by some of the historic homes and places that still exist in town. The United Nations designated the area of the Canadian Rockies as a UNESCO World Heritage Site in 1984. 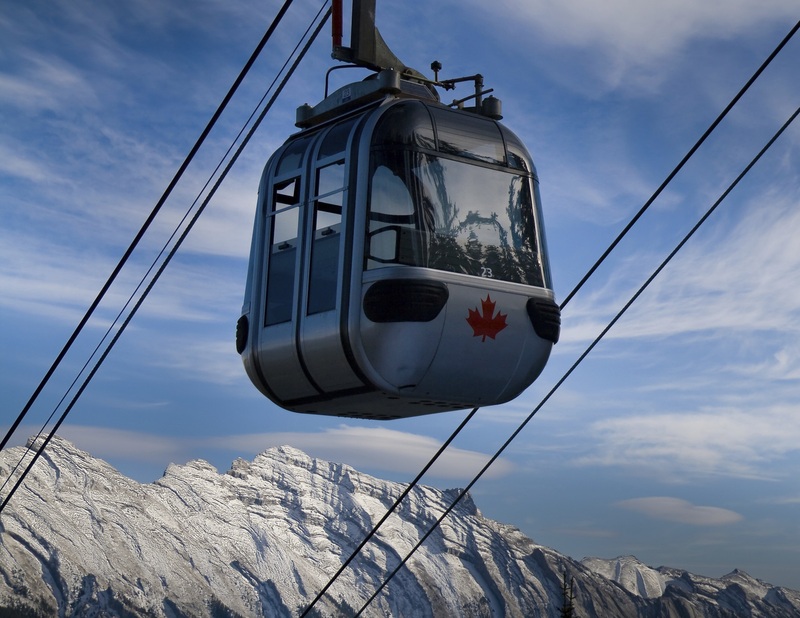 Just 45 minutes from the Town of Banff, Banff National Park is known for the longest ski seasons in North America and three world-class ski areas: Mount Norquay, Sunshine Village, and the Lake Louise Ski Resort. The Tri Area pass provides skiers access to 8,000 acres of ski terrain in Canada’s Mount Norquay, Sunshine Village, and the Lake Louise Ski Resort. The pass also provides discounted rates to guests who wish to access the Lake Louise Gondola. 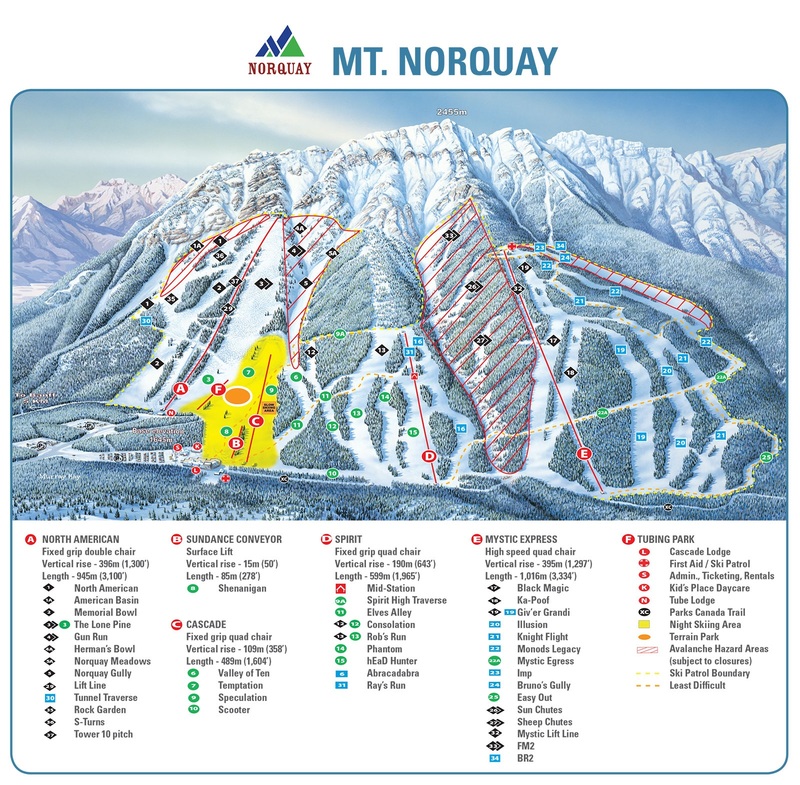 MOUNT NORQUAY: For those who want to be on the hill every moment of every day, fortunately, Mt. 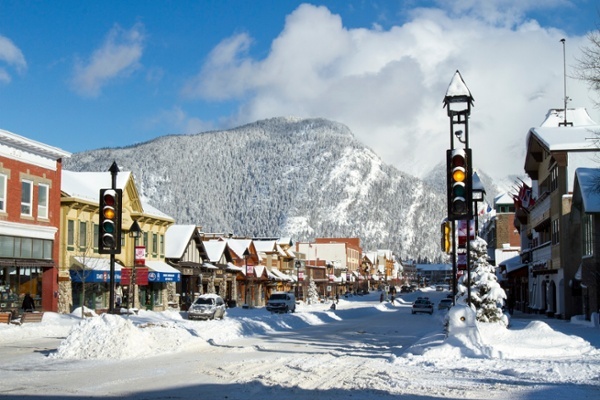 Norquay is located only 10 minutes from the Town of Banff. 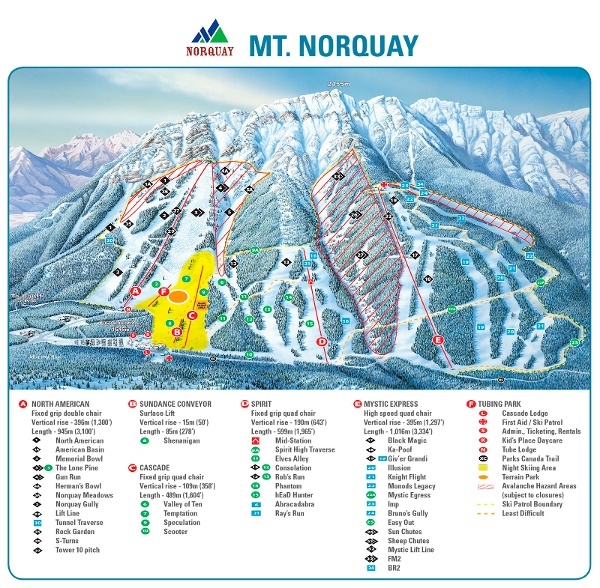 Mount Norquay is the most easily accessible ski area in Banff National Park. You may have all day, or just a few hours. Either way, it’s the perfect ski area to get your turns in when you can. 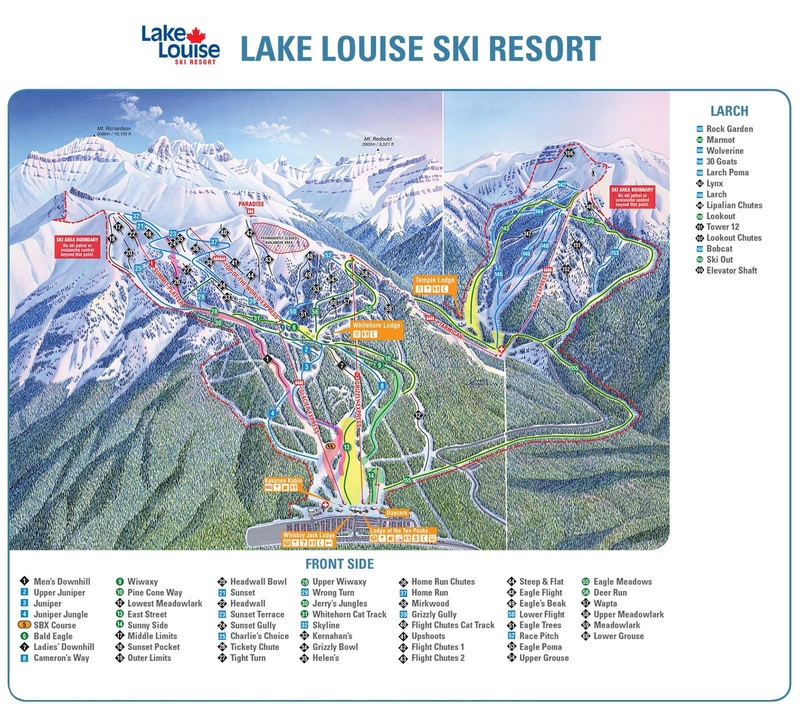 LAKE LOUISE SKI AREA: Have you ever found a hill that truly brought it all? Maybe you’ve been searching for the hill that can give you more. Lake Louise Ski Resort will give you more of everything: super views, big bowls, long, long runs and plenty of terrain for all ability levels. This ski resort is one of the largest ski areas in North America. You’ll quickly realize that your search for more is over, and you can’t wait to go back for another run. 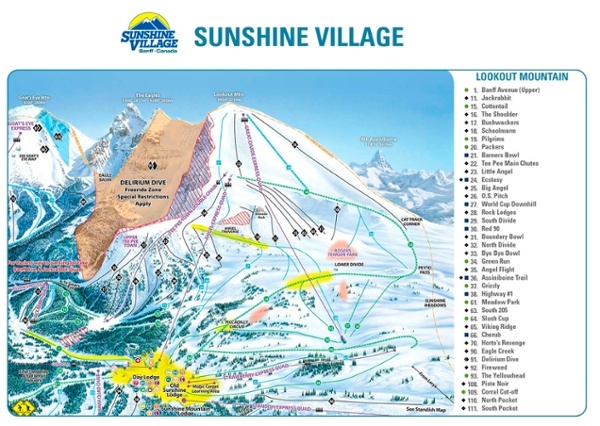 SUNSHINE VILLAGE: You’ve never seen anything quite like Sunshine Village. Reaching elevations of over 9,000 feet, you can stand at the top of a run, high up on the Continental Divide. At this point you find yourself far above tree-line with unobstructed views of the surrounding peaks. Then, as you head down the mountain, you notice that there is something really special about the powder. In addition to the incomparable skiing opportunities, Banff has a thriving arts and culture scene. There are a number of museums and art galleries to explore, not to mention concert venues at The Banff Centre. There are so many attractions in Banff you won't be able to visit them all in one day. From the Banff Gondola to the hot springs to lake cruises, there’s so much to do in this beautiful little town. 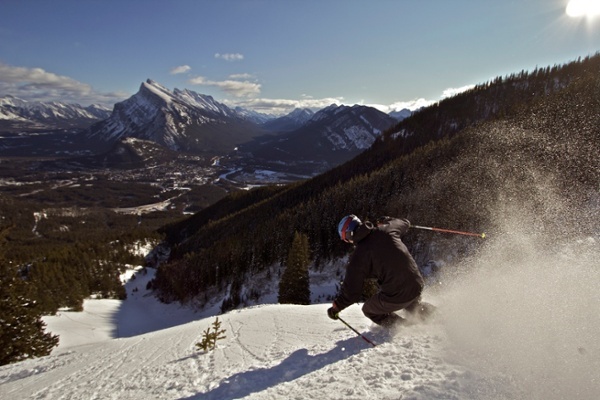 Let's get started on your Banff ski package!